My husband is a fort designer. Although he has been building forts since he was a kid, he really honed his craft over the last ten years by designing forts and huts for our cats out of cardboard boxes, blankets and pillows. We have one cat in particular, Mr. Meowmer, who goes absolutely crazy for his designs. Naturally, Brooke has started in on this family tradition and together they have created homemade forts from boxes, blankets and even a sun shade tent Brooke received as a birthday gift. I have just gotten used to having these creations littering our living room and hallways with a bemused smile. While there are times when I finally break down a multiple cardboard box fort for recycling (with sighs from my husband), I fully see their imaginative endeavors as a magical part of the creative process that includes the lovely role-playing games it generates. When I saw the latest Fortmajig product called Fun Fort, I knew this was perfect for our family and a great way to add a little designer attire to our forts that I would not mind leaving up in our house for even our most honored guests. Fortmajig Fun Forts are a large single piece of polyester material that comes with stretchy loops and has places to hook the loops throughout the product to make custom play spaces practically anywhere. Inventor Katherine Huck’s goals for her products are to provide high quality products that foster creative play and are built to last. 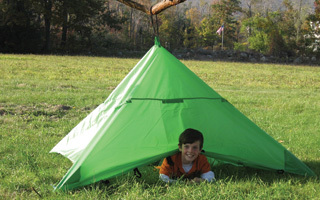 This product is extremely easy to use and we were able to make a teepee and then a canopy in practically no time. The thing I love is that it looks nice in high traffic areas and the portable ability of the product makes it easy to set up and take down throughout the entire house (and even outside, although we haven’t tried that yet). There is also instructions on how to make an 8 foot tunnel and Brooke loves every minute of her daddy’s designs! This product also comes with a really cute tote bag for easy storage. The Fun Forts are available in the colors of hot pink, blue and lime green. We have made the most out of our fun fort and our Fortmajig is currently up as a canopy prominently displayed in our living room, much to everyone’s delight! About Inventor Katherine Huck and The Happy Kid Company: Katherine and her Mom-Invented company is a very inspiring story of a 40 year old mom of three (the youngest was 10 months at the time) when she decided to launch The Happy Kid Company in 2006! Katherine captured the imagination of her own children with her creations and she knew she had something special she wanted to market. 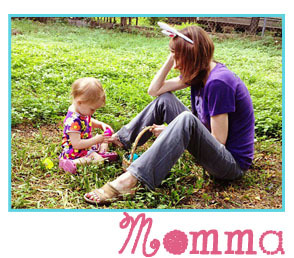 Katherin’s advice to other moms out there who have their own product ideas is to Trust Your Instinct! Katherine admits that the timing for her to start her business was not ideal, but that it was her instinct that drove the process to its success. Katherine recommends two great books for other moms who are interested in getting the inspiration to take that business venture leap; the Mom Inventors Handbook and Kick Start your Dream Business. Check out Katherine’s other classic play products, including separate panel design pieces called Connectables, here on her website.